Dashboard cameras and helmet cameras are becoming more popular, as drivers seek to lower insurance costs and prove who is at fault in the event of an accident. But they might not always work in your favour in the event of an accident. 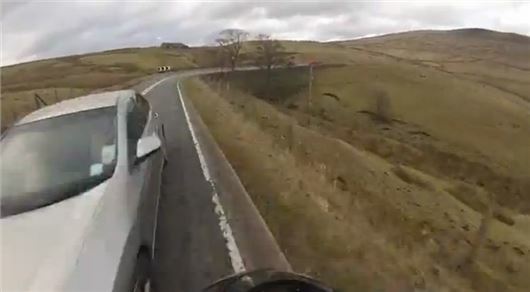 This helmet cam footage shows a rider crossing a double white line before making a mistake on a bend, narrowly avoiding an impact with a car and leaving the road. He ends up airborne, but manages to get up and seems relatively unscathed. He's lucky to be alive! Funny that a car site has this video in 'motoring news', is this an anti bike positioning?? I wrote this story and I'm a biker as well as a car driver - so no! On the Cat and Fiddle beween Buxton and Macclesfield. It has been reported that the rider is being prosecuted for careless/dangerous driving. As he posted this video on various sites for everybody to see he is also having a brain scan to find out if he's got one. The guy shows absolutely no remorse for nearly killing an innocent motorist/ family. I hope he is prosecuted for his recklessness.